A few days ago, Chris requested that I make something with peanut butter. Since I was in the mood to make some kind of dessert, I decided to make a peanut butter pie. I Googled “peanut butter pie” and the results were a little puzzling. The internet was buzzing with many food bloggers making peanut butter pies “for Mikey.” After further research, I learned that last month prominent food blogger Jennie Perillo’s husband, Mikey, suffered a heart attack and died leaving her to raise their young children alone. To honor Mikey, Jennie wrote a touching tribute on her blog, part of which I share with you. That explains the proliferation of peanut butter pies in the blogosphere. The food blogging community quickly mobilized for Jennie, surrounding her with an outpouring of support, starting a fundraising campaign to help her financially, and of course, making peanut butter pies. I read a great number of food blogs, but I don’t specifically recall ever reading hers so I don’t want to seem like I’m jumping on the bandwagon or capitalizing on her pain. I have great sympathy for Jennie, her daughters and her family, but I didn’t make my peanut butter pies for her, nor for Mikey. That would be insincere on my part. I did, however, make them for someone I love very much. Place the Oreos into the bowl of a food processor and pulse into fine crumbs. In a small bowl, combine cookie crumbs and melted butter. Evenly divide the crumbs between eight individual serving dishes and press lightly into the bottoms of the dishes to form thin crusts for the pies. Place a spoonful of melted chocolate on top of the crust. Sprinkle with chopped peanuts. Set aside. In the bowl of a stand mixer fitted with the whisk, beat the heavy cream until stiff peaks form. Transfer the whipped cream to a small bowl and set aside in the refrigerator. Place cream cheese and peanut butter in the stand mixer bowl and beat on medium speed until smooth. Reduce speed to low and gradually add in sugar. Add in sweetened condensed milk and vanilla extract and beat on medium speed until mixture is creamy and smooth, scraping down the sides of the bowl as needed. Stir in 1/3 of the whipped cream into the filling mixture. Fold in the remaining whipped cream with a spatula until well blended . Evenly pipe or spoon the filling about halfway into the serving dishes. Sprinkle some chopped oreos (surprise your eaters) and then resume filling the serving dishes to the top. Cover with plastic wrap and refrigerate for at least 3 hours before serving. 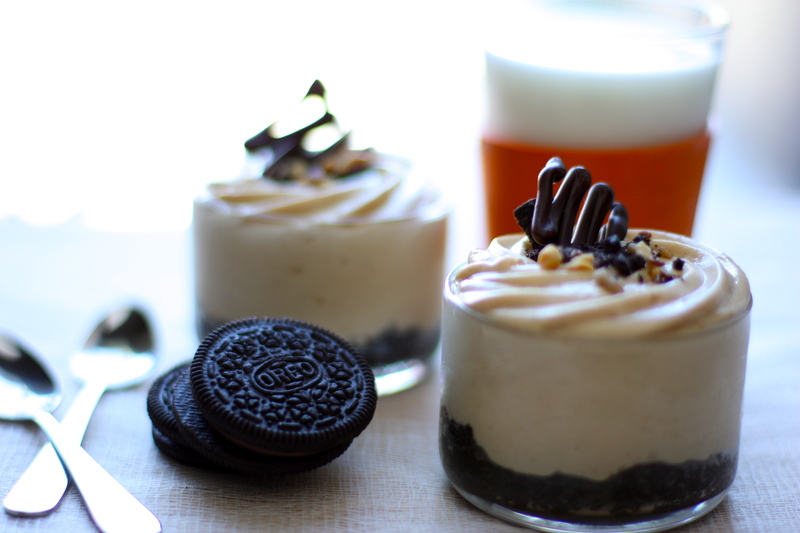 Garnish with crushed Oreos, chopped peanuts, and chocolate and serve with a tall glass of ice cold milk. 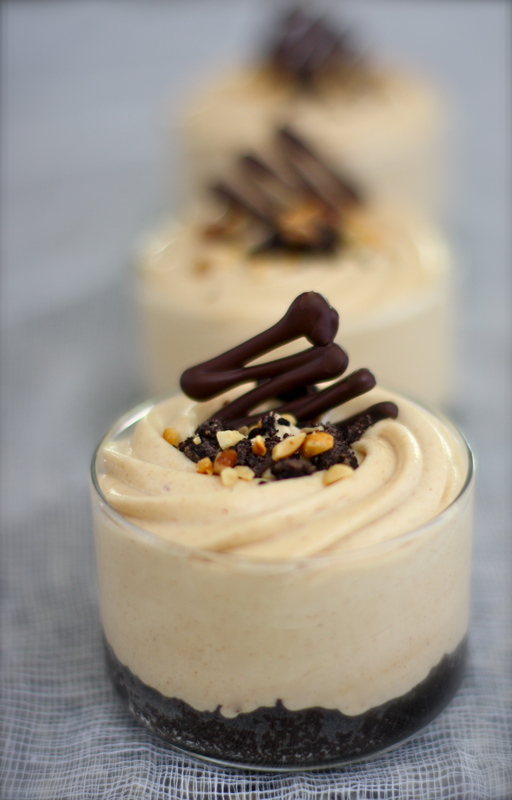 *The next time I make this, I would reduce the amount of sugar from 1 cup (in the original recipe) to 3/4 cup and reduce the condensed milk to 10 ounces or so since the filling is extremely sweet. I decided to add the chocolate and chopped peanuts at the bottom as a surprise treat, but in the future, I would mix the chocolate in with the filling. I would still sprinkle chopped nuts on top of the crust. I want to make these! They look so good and I love the chocolate on top! Very cute! I love the way you garnished the top. I’m the person I know with the most intense peanut butter addiction, but when I make treats I share them with my boyfriend because he’s the person I love the most.